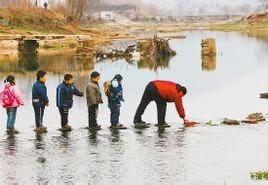 Crossing the Stream and Reaching the Sky – Jeremy S. Wu, Ph.D.
Limited by expertise and conditions at that time when there was no statistical infrastructure in China to provide accurate and reliable measurements, the chosen path was the only option. In fact, this path was traveled by many nations, including the U.S. At the beginning of the 20th century when the field of modern statistics had not taken shape, data were not believable or reliable even if they existed. Well-known American writer and humorist Mark Twain once lamented about “lies, damned lies, and statistics,” pointing out the data quality problem of the time. During the past hundred years, statistics deployed an international common language and reliable data, establishing a long history of success with broad areas of application in the U.S. This stage of statistics may be generally called Statistics 1.0. Feeling the rocks may help to across a stream, but it would be difficult to land on the moon, even more difficult to create smart cities and an affluent society. If one could scientifically measure the depth of the stream and build roads and bridges, it may be unnecessary to make trials and errors. The long-term development of society must exit this transitional stage and enter a more scientifically-based digital culture where high-quality data and credible, reliable statistics serve to continuously enhance the efficiency, equity and sustainability of national policies. At the same time, specialized knowledge must be converted responsibly to practical useful knowledge, serving the government, enterprises and the people. Today, technologies associated with Big Data are advancing rapidly. A new opportunity has arrived to usher in the Statistics 2.0 era. Simply stated, Statistics 2.0 elevates the role and technical level of descriptive statistics, extends the theories and methods of mathematical statistics to non-randomly collected data, and expands statistical thinking to include facing the future. One may observe that in a digital society, whether it is from crossing a stream or reaching the sky, or from governance of a nation to the daily life of the common people, what were once “unimaginable” are now “reality.” Driverless cars, drone delivery of packages, and space travel are no longer imaginations in fictions. Although their data that can be analyzed in a practical setting are still limited, they are within the realistic visions of Statistics 2.0. In terms of social development, the U.S. and China are actively trying to improve people’s livelihood, enhance governance, and improve the environment. A harmonious and prosperous world cannot be achieved without vibrant and sustainable economies in both China and the U.S., and peaceful, mutually beneficial collaborations between the nations. Statistics 2.0 can and should play an extremely important role in this evolution. The WeChat platform Statistics 2.0 will not use low quality or duplicative information to clog already congested channels, but it values new thinking to share common interest in the study of Statistics 2.0, introducing state-of-the-art developments in the U.S. and China in a simple and timely manner, offering thoughts and discussions about classical issues, exploring innovative applications, and sharing the beauty of the science of data in theory and practice.